Nobody likes blackheads on nose and face. Blackheads are clogged pores which are the result of excess oil, produced by the sebaceous glands (oil glands). Excess oil is usually produced due to hormonal changes, pregnancy, menstruation, eating lot of fried foods, excessive use of oil based cosmetic products etc. There are several blackhead removal products in market but they often use some chemicals which can harm your skin. 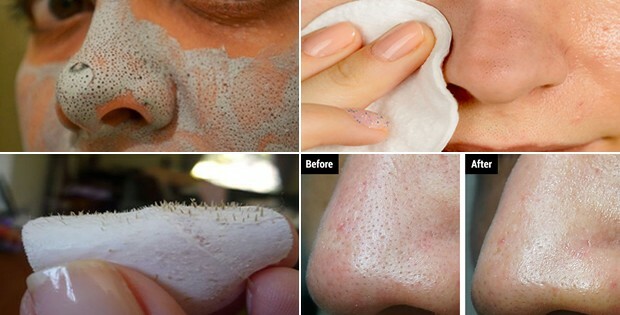 Try this 3 step method to remove blackheads fast and naturally. Boil water and let that water cool down for a while. Pour this boiled water on to a small face towel. Take the soaked towel and clean the areas where you have blackheads as it helps to open up the pores and makes it easy to extract the blackheads. Squeeze some toothpaste in a bowl, add salt into it. Mix them together with your toothbrush. Now gently scrub your nose with this toothbrush but be gentle, don’t overdo, just do it for 2 minutes. After that wash it off with normal tap water. Add all the above ingredients, adding lemon juice in the end. Mix it well to make a paste. If you feel that it is too thick, add some more lemon juice. Now apply a thick layer of this mixture on your blackheads. Let it stay for 15 to 20 minutes, when it completely dry, wash it off with cool water. The lactic acid in yogurt can help soften the skin, making it supple. Citric acid in lemon juice regulates the amount of oil you produce in your skin while cleansing and making your skin appear brighter. Multani Mitti absorbs excess oil, improves skin elasticity, removes dead skin cells and blackheads.